With apologies to the originators of the technology adoption curve, the adopters of electric cars in Australia fall into several categories that we think will influence the overall adoption scenarios. · Genuine innovators who have purchased electric vehicles when they were hard to get and hard to drive and charge. · People with significant amounts of discretionary funds who are attracted to vehicles like the high-end Teslas. 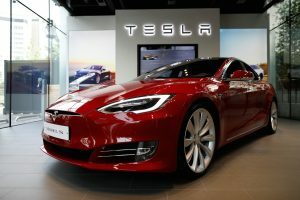 · People who can afford to buy an electric vehicle even though it is far more expensive than a fossil fuel car and wish to use it as a status symbol for their green credentials. Due to the work I am involved in and the circles that I move in, and despite the relatively low numbers of pure electric vehicles in Australia I personally know people in each of these categories. As a general principle I believe that people are free to spend their own money as they wish. However, I really struggle with those people that buy a high-end electric vehicle to burnish their environmental credentials and brag about it. According to the National Transport Commission, in 2017 the national average carbon dioxide emissions intensity from new passenger and light commercial vehicles was 181.7 g/km. So assuming that a vehicle was driven 15,000 kilometres the carbon emissions would be 2,725 Kg of carbon dioxide. So assuming that the electric vehicle was charged 100% with renewable energy that would be the saving. This is of course on the high side for high-end sedans but let’s leave that to one side. As a contrast, we installed 9.86kwh of solar panels with an 8.2kw inverter on our house for just over $10,000 last year (after rebates). From March 1st 2018 to the end of February 2019 that system has produced 12,576 kwh of energy. It is hard to get an exact figure on how much carbon dioxide production is reduced by that production because it depends on the generation mix and where you are located. Figures at Solar Market indicate a saving of 1.75 tonnes to 2.05 tonnes in 2013 for 3200 kwh produced depending on the gas and coal mix that is substituted for. Due to changes in the power system since then the carbon intensity is lower so lets use 1.5 tonnes for 3200kwh. So the saving from our solar system would be roughly 6 tonnes. This is a little less than what my inverter system and electricity bill says so it is a reasonable estimate. A new Tesla Model S 100 D is listed on the Tesla Australian site at $141,000. By contrast, I can buy a 2019 BMW330i Luxury Line for $76,572 which while not a top end luxury vehicle is still a pretty nice car. So I could buy that car and use the difference to the Tesla purchase price to install 6 lots of solar panels to the same specification that I have installed on my house. That would save 36 tonnes of carbon dioxide compared to buying a Tesla S 100D and saving about 2.73 tonnes.